For over 50 years the Gould family have handmade cheddar cheese on their farm using milk from their own cows. The award winning traditional cheddars are very popular at the market particularly the ‘extra-tasty!’ More recently the Gould family have started producing flavoured cheddars including ‘hot chilli and chive,’ ‘garlic and mixed herbs,’ ‘cranberry,’ and many more! 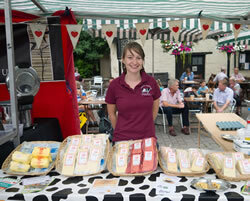 Our own farmhouse butter and free range chickens eggs are also available on the market stalls! This entry was posted in Dairy and eggs, SFM@Frome Independent. Bookmark the permalink. Both comments and trackbacks are currently closed.